He isn't nicknamed "Chameleon" for nothing. A common gesture for villains, Anti Heroes or anyone with a mean, sadistic streak is to have a significant portion of their tongue extended out of their mouth even when there's no plausible reason to do so. Usually paired with an Evil Laugh, Laughing Mad or Slasher Smile. This, like Lecherous Licking, Finger-Lickin' Evil, Overly Long Tongue and other tongue tropes, is using the squicky nature of the tongue to symbolize someone you just don't want to be around — in this case, a dangerous person. It can be used to show the character in question as mentally disturbed or impaired, or alternately just being silly. It's also heavily associated with The Rock Star, especially Heavy Metal stars. Subtrope of Character Tics. Compare Licking the Blade. Dragon Ball Z, Broly... at one point after Goku kicked him in mouth, he licks the blood off his with satisfaction. Even Goku, whose usually never grossed out by anything, has the appropriate reaction . Goku: Eww... that was completely unnecessary, disgusting. Donquixote Doflamingo is known for making this kind of face, usually when he laughs. He's also a notorious Ax-Crazy pirate. Caribou is another, and he can come across as even more maniacal than Doflamingo. He also likes to lick his own hair while sporting a Slasher Smile. Rob Lucci and Jabra seem to occasionally let their carnivorous-animal side take influence in their behavior, since when they're transformed they both respectively lick their lips when a good fight (Luffy and Sanji) come along. Bellamy the Hyena is another pirate who is often seen sticking his tongue. In fact instead of the more traditional skull, his personal jolly roger is a pair of lips with a tongue sticking out paired with the crossbones. It's all makes sense since he's Doflamingo's subordinate. Caesar Clown ◊ nuff said. Big Mom has her tongue out when she's most excited and hungry plus a good amount of drool, and when she's on hunger induced-rampage and has her tongue out plus the crazy eyes it's the signal to run the hell away. Anime episode #49. In a Flash Back Kaien Shiba is possessed by the hollow Metastacia and turned into a vicious, deranged killer. At one point he sticks out his tongue at Rukia, as seen here . The Fifth Espada, Nnoitra Gilga, not only likes to do this, but he also has a reason for it: the number signifying his Espada rank is tattooed on his tongue. As a bonus Nnoitra also shoots his Cero from the tip of his tongue. When Nianzol first reveals his presence, mocking Shutara for accusing Yhwach of insolence, his grin is accompanied by his two tongues lolling out in a W-shape. His Sternritter letter is 'W'. Deadman Wonderland: After dropping her act as an Innocent Flower Girl, Minatsuki Takami (a.k.a. "Hummingbird") reveals herself to be a tongue-lolling, blood-whipping, sailor-mouthed Combat Sadomasochist, albeit a likeable one. Later defrosts into a Sociopathic Hero. Naruto: Orochimaru, being a humanoid snake, does this often. And it's all intimidating. Kabuto picks up this habit after integrating Orochimarus cells. Vento of the Front ◊ from A Certain Magical Index, complete with tongue piercing. My Hero Academia: Hero Killer Stain often displays a ragged-looking tongue, partly because his powers require consuming his target's blood. Yami Malik from Yu-Gi-Oh! contorts his tongue in several different ways. It's very, very creepy. Yami Yugi: Jeez! You're like an evil Jean Simmons! Correction! You're like Jean Simmons! Venom (especially Eddie Brock) had gone from being a villain, Anti-Hero and then zigzagging between the two ever since, but he's always memorable by his Slasher Smile with his alien tongue. Carnage does it even more. Ed is the least intelligent of the Terrible Trio of hyenas. He is almost always laughing with his tongue sticking out. Simba in "I Just Can't Wait to be King" sports one when teasing Zazu. Alice in Wonderland. The Cheshire Cat does this while talking with Alice to show that he's not all there. Watch it here . Barty Crouch Jr. often licks his lips in his more insane moments in the film version of Harry Potter and the Goblet of Fire. Barty Crouch Sr. begins to suspect that Mad-Eye Moody is actually his son when Moody licks his lips in the same manner. The Joker from The Dark Knight licks his lips while he talks a lot. Word of God states that this was a result of Heath Ledger being annoyed by the feeling of the scar prosthetics and unconsciously licking at them because of it and after seeing him do it a few times with the full make-up and finding it seriously creepy, they decided to just make it part of the character. In Highlander, the Kurgan does this to intimidate a group of nuns in a church. Which characteristic was then copied onto the Suspiciously Similar Substitute villains from the next two movies. One of Freddy Krueger's trademark gestures in A Nightmare on Elm Street films is to wiggle his tongue at his victims in a sexual-predatory manner. He can even do it through a telephone! Kiss. Gene Simmons' onstage persona "The Demon" is a firebreathing monster of rock and roll. He's well known for sticking out his 7 inch tongue. Miley Cyrus adopted this during her party-animal phase between 2013 and 2017. The Great Muta has shown these tendencies. Most frightening when his tongue is stained the same color or in a clashing color to his face paint after using his mist. The Undertaker is an electricity controlling, teleporting, implacable zombie who not only threatens his opponents with defeat but also their lives and souls. He likes to stick out his tongue ◊ during his rest in peace pin. Tasha Simone, especially when using the stomach claw. 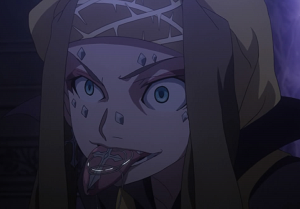 Vampire Warrior Gangrel doesn't just have fangs but a pointy tongue ◊. For that matter, the other half of the original Diabolic Khaos, Delirious is also known to let his tongue dangle on occasion or excessively lick around his face/mask. Mad Man Manson, who know, in his name and hairdo weren't big enough giveaways. Psycho Clown of AAA's Psycho Circus just doesn't know when to keep that thing in his mouth, it's always out. Black Rose usually has nonchalant and methodical approach to wrestling, but their are some opponents that make her completely lose it, such as long time enemy La Amazona and, for some strange reason , Angel Rose. The first World Wrestling League Heavyweight Champion Monster Pain, so much it is merchandised . Also, his rival, Seven Foot Giant Titan. Roderick Strong, after failing to win the Pro Wrestling Guerilla World Championship from Kyle O'Reilly, well his composure wasn't that normally associated with sanity. Look at Perro Aguayo Jr. lap it up. A staple of the Mutant Chronicles universe with its various demonic entities, especially Nepharites are found of lolling around with their worm-like tongues. In Bloody Roar, there's Hajime Busuzima (pictured above), a Mad Scientist who turned himself into a Zoanthrope. And his choice of animal happened to be a Hollywood Chameleon (so he has the entire trope package of Lecherous Licking, Overly Long Tongue, etc), so sticking his tongue out regularly in his human form seems rather natural. Ripper Roo in Crash Bandicoot series is a deranged mutated kangaroo who has his tongue sticking out most of the time and laughs maniacally. Crash Bandicoot himself also pulls off this expression a lot. Demon Lord Ghirahim from The Legend of Zelda: Skyward Sword has one to accentuate his creepiness. Kirby: Marx, when he becomes Marx Soul, has his tongue sticking out at all times, with mad cackles and high pitched scream to match. The King of Fighters: Ryuji Yamazaki, a Psycho for Hire, sticks his tongue out in some of his moves, sometimes to mock his foes and sometimes because he's really enjoying it. He also has a slight snake motif in him, which also helps. Angels of Death's Danny Dickens sticks his tongue out when it's revealed how crazy he is. Touko Fukawa gains an Overly Long Tongue whenever their Serial Killer Split Personality, Genocider Syo, has taken over. Another one is Junko Enoshima. She sticks out her tongue for her "crazy" personality. In Ace Attorney Investigations: Miles Edgeworth 2, the Big Bad has one of these.